Unbeknownst to Deptford, extreme climate change has caused a huge flood, which will overwhelm London. How can we prepare? What can we do? 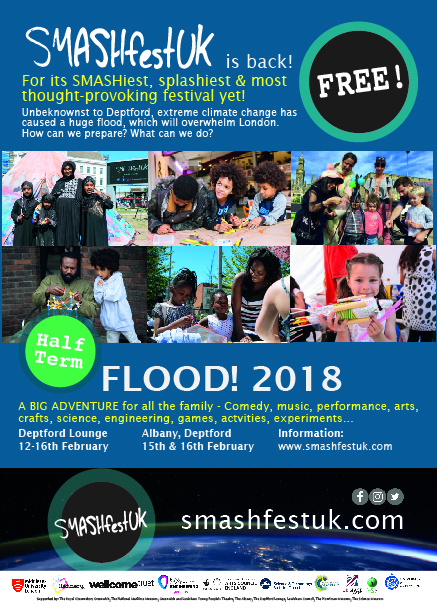 The annual free family festival which focuses on science, technology, engineering and the arts is back next week at the Deptford Lounge and the Albany. 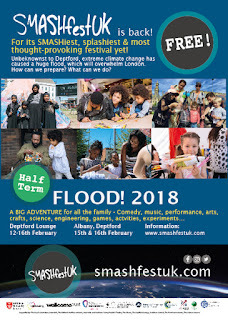 It's billed as a big adventure for all the family – comedy, music, performance, arts, crafts, science, engineering, games, activities and experiments… SmashfestUK is an award-winning narrative-driven science/arts festival which aims to widen participation and increase diversity in STEM and the arts. Each year it focuses on a different natural disaster, featuring interactive installations, games, experiments, comedy and storytelling for all the family. This year's theme - flood! - takes over The Albany Theatre and Deptford Lounge over half term from 12 - 16 Feb. They will be tackling a topical and challenging subject - a climate change-induced flood that submerges London.